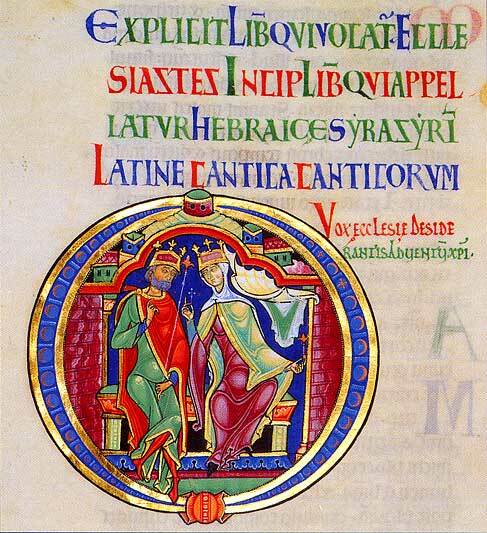 This is a beautiful, historiated initial letter from the beginning of Song of Songs in a twelfth-century Latin Bible. The Bible is now located in the library of the Winchester Cathedral. The Latin text accompanying the initial is fairly standard for this period. Explicit lib(er) qui vocat Ecclesiastes. Here ends the book that he called Ecclesiastes. Incip(it) lib(er) qui appellatur hebraice Syr asyrim, latine Cantica Canticorum. Here begins the book that is called in Hebrew "Shir hashirim," in Latin "Songs of Songs." Vox ecclesi(a)e desiderantis adventum Chri(sti). The voice of the church as she longs for the coming of Christ. This manuscript, like many Latin manuscripts of the Song of Songs, illuminates the "O" with which the Latin text begins: "Osculetur me" ("Let him kiss me"). Note that the "O" itself is gilded, that is, a very thin layer of gold leaf has been laid down upon a slightly three-dimensional sizing to make it stand out from the surface of the parchment page. This dimensionality makes the color of the gold change around the circle. And if you were to hold the manuscript, the color of the gold would continually change as your eye moved and the gold caught the light at different angles. The illumination itself is painted within the golden "O" in relatively subtle colors, and in a style similar to secular paintings of the high middle ages in Europe. The word "illumination" in this context refers to the way the picture brightens up the page. There are a number of different types of illuminations used during the medieval period to historiate the opening letter of the Song. This example belongs to a large group in which Christ and the Church are represented together, but without embracing or kissing. This is a reference to the common interpretation of the Song, in which the two lovers are understood as representing Christ and his bride, the Church. Notice that both man and woman are crowned and enthroned, and each look at the other. The king holds a foliate scepter, and the queen holds a foliate ornament. The illumination is on the verso of folio 270. The number of this illumination in the Princeton University Index of Christian Art is 32/W7/LC1.C.270B. View a Romanian translation by Aleksandra Seremina. View a Ukrainian translation by Oleg Segal. View a Russian translation by Alexander Nikiforov. View a Bashkir translation by Ayrat Israfilov. View a translation into Portuguese by Artur Weber.